“In 1935 Rene was hired by the Enzo Ferrari to drive for Scuderia Ferrari, the private team campaigning Alfa Romeos. Rene’s friend Louis Chiron was on the team, as was Tonino Brivio. Tazio Nuvolari was team captain. The drivers discussed who was really the best driver. 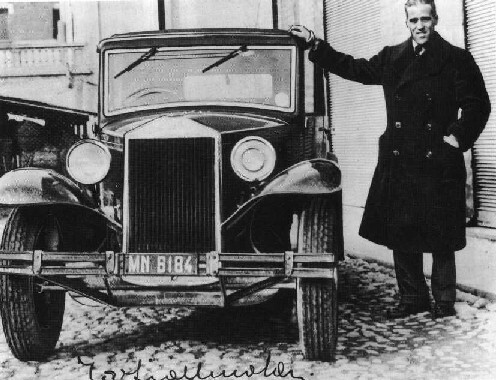 Nuvolari suggested that all the drivers buy matching new Lancia Augustas and race from the center of Milan near the Duomo to the hunting lodge in the outskirts of Milan where the team meetings were held. And Nuvolari always won. The others knew he was doing something to get ahead of them in the twisting roads in the woods. So Chiron claimed he was ill and could not make the next meeting. He hid on a hill in the woods to watch Nuvolari come through. Nuvolari approaches the curve, tosses out the rear end, touches the curb to stop the spin and stabilize the car and shoots off. Chiron tells the others, so the next time, they all do the same. Dreyfus, chasing Nuvolari as closely as possible, goes, does the same turns, and clips the curb, breaks the axle on the Lancia, and the car is by the side of the road. Next comes Chiron and then Brivio, and they too clip the same curb, and there are the three Augustas, all by the side of the road. The stories told late at night. Warms the heart.